This is the third part in a series of discussions regarding The Idle Parent Manifesto, which can be found in Tom Hodgkinson’s book The Idle Parent: Why Laid-Back Parents Raise Happier and Healthier Kids . Need to get caught up? You can do so here. We reject the rampant consumerism that invades children’s lives from the moment they are born. Eli’s favorite show right now is the LEGO Ninjago series. Mike and I both like it as well and we appreciate that it taps into his longing for heroes, villians, weapons and fighting while remaining age-appropriate. And yet, as much as we like it, it’s really no more than a vehicle for LEGO to advertise to kids for 30 minutes stretches. Just in case your kids missed the LEGO consumer bus, there are plenty of ads for non-LEGO things during the commercial breaks. “I want that!” Eli would say, during 99% of the commercials. If we weren’t laughing, we’d be crying. There’s really only one way to reject this rampant consumerism, and that would be to ban all screens from your home and to stay out of the stores. I’d venture to guess that’s not a possibility for any of us. It’s a part of life. How do we reject it without moving to a wi-fi-less commune? We get MAD, that’s how. The author suggests that instead of banning screens altogether, it’s more realistic to minimize, and I agree. Banning something makes it that much more attractive, for one. Also, for most families (mine included), screens are an enjoyable part of life. We like our shows and movies. We love the internet and our apps. In a sea of crap there’s a lot of good stuff to be found. Decide how much time spent with screens is appropriate for your family. Don’t worry about what everyone else is doing – do what works for you. Maybe you know it’s taking over your lives and you need to cut it out completely for awhile. Maybe you’re just worried that your kids are going to waste the summer away in front of a screen if you don’t do something. If you don’t have any limits, definitely set some. If you do, think about decreasing it even just a little. Now here’s the thing about minimizing: if you just turn off the TV or take away the iPad, you’re going to hear about it. There will be much wailing and gnashing of the teeth. In order for it to work in the long run, we as parents have to put effort in at the beginning. I know, I know, effort is the opposite of idle. BUT … for many kids that horrible sensation they feel when they lose a screen, also known as boredom, is unbearable. They don’t know what to do with it. In our overstimulated, busy world, kids don’t get the chance to be bored very often, if at all. We have to take some time to lead our kids into another activity. In some cases you literally have to teach them how to play. If you can get over the interminable 10-15 minutes when they act as if they will die, they’ll fall into a new activity and probably surprise you with their ingenuity and imagination. Don’t be afraid or unwilling to help them get there … and then walk away and enjoy it! Consumerism and advertising are everywhere. You could ban every screen and shop alone, but still it’s going to touch your kids. Accept it, but draw your own line in the sand and reject the idea that we have to buy into every single fad that comes along. Maybe you decide that your family won’t buy toys, clothing or food with characters on them. Maybe you opt to spend free time at the library or park instead of a bookstore or the mall. If there are certain programs, games or even friends that seem to poke the consumer monster in your kids, consider cutting those things out of your life. Sometimes the commercials we see or the trips down the toy aisle can spark really good conversations with your kids. You can talk about what an advertiser is really trying to sell. Do they think the product can do everything it says it can? How is a yogurt with Dora on it different from the one without a character? We use Common Sense Media to help navigate the movies, games, books, music and apps marketed to kids. One of the things I love about their rating system is that it includes consumerism as a category, warning you if it’s going to be an issue. Another idea the author floated gave me pause: he wonders why screens are so desirable. Does it possibly give kids access to freedom and a certain amount of control over their lives? What if we continually enlarged their freedoms so that they could make decisions in real life instead of a virtual one? We’ve started to let Elena go to the park and playground without us … and she’s yet to ask if her iTouch or Nintendo DS can come along with her. The bottom line is that we can’t escape the rampant consumerism that surrounds us. The Idle Parent recognizes that it’s there and that it can be tamed. As Idle Parents, we can choose to do and see things that don’t feed the monster. We can also take advantage of the beast to teach our kids how to be smart, savvy and responsible consumers. 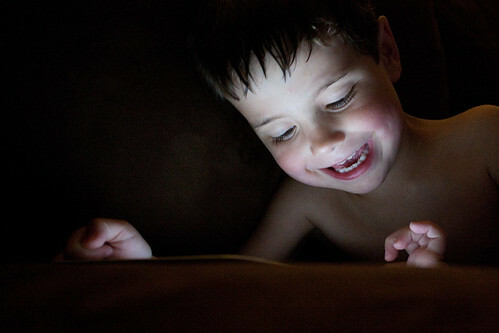 A little bit of screen time when our kids are young can save our sanity. And teaching them how to handle it now will help them grow into responsible adults with the social skills and financial tools to function on their own – so we can truly be idle parents without our 25-year-old kids living in our basements! How do you handle the relentless consumer lifestyle with your kids? Do you feel like you have it beat, or does it feel like you can’t escape it? National Backyard Games Week: Simon Says Go Outside! Growing up, I was lucky enough to have a group of kids roughly my age to play with nearby. We lived just up the street from a lake, and the kids that lived on the lake had the absolute best yard to play in. I don’t ever recall them having a sandbox, a swing set, or even that many toys, really. But they had a lake we could swim in, a tree we could climb on, a hill made for rolling in the summer and sledding in the winter, and the perfect open grassy area for pretty much any game we came up with. I remember playing kickball, baseball, tag, red rover, red light green light, sharks and minnows and every variation of TV show/movie that was popular in the mid-to late-80s (The A-Team anyone?). 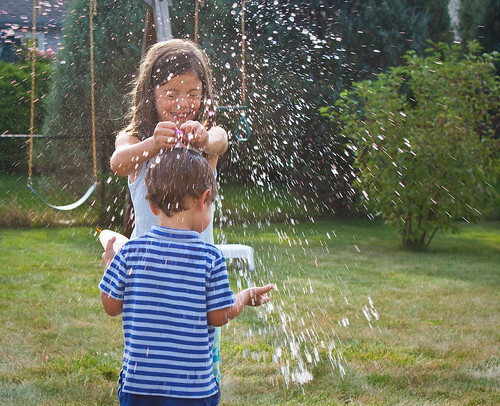 May 21-27, 2012 is National Backyard Games week. It’s a week set aside to encourage families and friends to play together outside. Thinking back on the games I played as a child, I realized how little my kids know about these games. It’s not that we haven’t made an effort, it’s that rarely are there any other kids outside to play with. Have you ever tried to play freeze tag with just your little brother? It’s pretty lame. 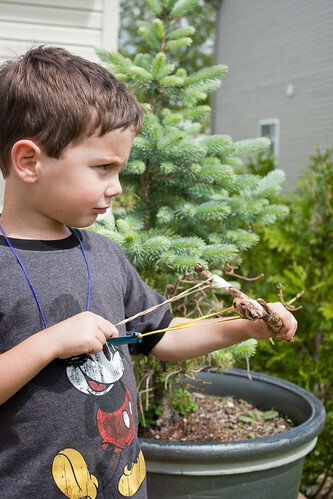 Here are a few resources to get you outside and playing in your backyard. It might be a little quiet out there at first, but my hope is that as more and more of us encourage our kids to play freely outside, there will be more kids to play games with. A great resource with more than 70 well-loved outdoor games. Explains how to play each game, and lists useful information like how many players are needed, what ages can play, what kind of space you need and any necessary materials. We have the girls’ book and it has some great ideas, such as 14 Games of Tag, jump rope games, hopscotch and jacks. Now get outside and play! Last one off the computer is a rotten egg! Are you familiar with KaBOOM? If you’ve heard of this fabulous non-profit, it’s most likely in conjunction with their mission to build playspaces in areas that need them. Perhaps you’ve even participated in a KaBOOM! Community Build. That in and of itself is awesome, but KaBOOM! is about so much more. Their ultimate mission is saving play for America’s children. Last year our family worked with KaBOOM! for their Park-a-Day Challenge. The kids and I spent most of the summer visiting area playgrounds and making sure they were accounted for and documented properly on KaBOOM!’s Map of Play – an excellent resource to find playspaces wherever you go. A few weeks ago I was asked if I had any photos or videos I could share with them that showed our kids playing in ways that might be considered risky. Of course I did, and the result is that you might recognize a few faces in the video I’m about to share. The video is entitled “The Benefits of Risk in Children’s Play.” Produced by KaBOOM! and The Alliance for Childhood, the video features Tim Gill (former director of Play England and author of No Fear: Growing Up in a Risk-Averse Society), Darell Hammond (Founder and CEO of KaBOOM! ), Dr. Elizabeth Large (Pediatrician), and Janice O’Donnell (Director of the Providence Children’s Museum). Risk teaches children many invaluable lessons, yet in today’s American culture we are conditioned to protect our children from risk and encouraged to steer our children away from any situation where they might encourage risk. As the participants in the video mention, we have confused managing risk with reducing risk entirely in our children’s lives. There are so many topics within this video that I would love to delve into further, and definitely will address in the weeks to come. For now, however, I’d just love for you to check out the video and let me know what you think. And definitely check out the kids (big and small!) hammering nails, jumping bike ramps, and conquering the slackline! If you feel as strongly as we do that our children must be allowed and encourage to take risks in order to thrive and grow, please share this video on your blog, website, Facebook page or Twitter. Task: Make an awesome shooting tool. Pebbles, peas, flower buds, acorns … pretty much any small object for ammunition. In a circumstance of happy coincidence, Eli and I found the perfect forked stick on our way to throw rocks. Therefore, that’s my first piece of advice if you want to make your own slingshot: always be on the lookout for the perfect stick. Nothing will slow your weapon-making roll like not being able to find a single useful forked stick when you want one. After that, it was pretty simple. We chose a piece of fairly thin, supple leather for our ammunition pocket. Elena followed the instructions and put the slingshot together herself in about 5 minutes. It’s a sturdy little weapon (okay, we might have needed a little bit of duct tape), and it’s been fun for the kids to work on target practice. It’s not hard at all to launch a pebble a great distance … it’s the aim and accuracy that takes lots of practice. We’re on the prowl for more perfect sticks. One slingshot isn’t going to be enough, especially over the summer. They’re fun and very portable and the envy of the neighborhood. Every kid wants to try it and every parent yells at the other kids to get out of the way (rightly so). Without realizing it, the kids are learning about aim, trajectory, effect of ammunition size and shape … basically their own little hands-on version of Angry Birds. If you just can’t find that perfect stick or you want to bypass the whole DIY bit, you can purchase a ready-made slingshot. Make a pocket for your slingshot. Cut a small rectangle out of leather or a scrap of sturdy cloth. You can either tie the rubber bands to the pocket, or cut two small holes at the edges and loop the bands through. Assemble the slingshot. Tie the rubber bands to the ends of a forked stick. Gather your ammunition and get ready to shoot! Place your ammunition in the pocket and trap it by pinching with your thumb and forefinger. Hold the handle steady at an arm’s length. Pull back on the pocket, aim, and fire! Have fun coming up with different targets and ammunition. Aluminum cans, paper bulls-eyes and lines of action figures make great targets. Of course if you have terrible aim, you can always start with the broad side of a barn. 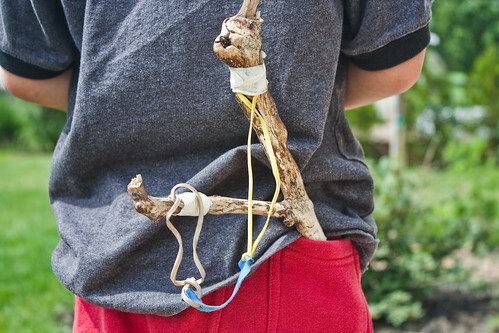 Did you ever own or make a slingshot as a kid? If you make your own, I’d love to see your photos on our Facebook page! Well, I’m so pleased with myself. I managed to do one of the things I posted on my first Risky Pins post – visit the Cincinnati Nature Center! There are always so many awesome ideas on Pinterest … if only we could pin a few more hours onto each day! I’m hoping to do a lot of these things over the long, lazy days of summer. This post on how to put together a “tinkerer’s toolbox” for kids is awesome. I plan to put together a kit like this and set up a table in the garage so that the kids can tinker away this summer. I can’t wait to see what they come up with! The kids are loving this book our friend, Lisa (of slackline fame – isn’t she the bomb?! 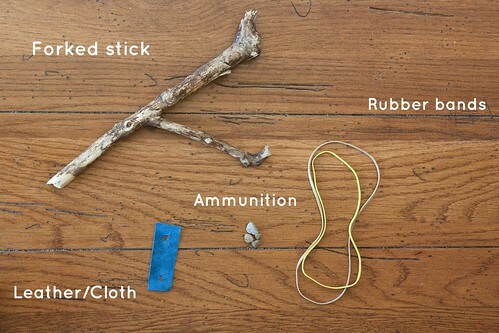 ), gifted us: Mini Weapons of Mass Destruction: Build Implements of Spitball Warfare. I’m still finding pennies everywhere from the penny shooter. Our goal is to build something with enough range to battle the bunnies that terrorize our garden. How about some LEGO balloon car races? If you’re on Pinterest let me know so I can follow your boards!